The cornea is the clear front layer of the eye that covers the iris and pupil and anterior chamber of the eye. The cornea is responsible for refracting two thirds of the eyes total optical power. The cornea does not contain blood vessels and receives its nutrients from tear fluid or aqueous humour. The cornea is made up of five layers with the most outer layer being the epithelium. The epithelium is a multicellular tissue layer with fast growing, regenerative cells. The cornea is one of the most sensitive tissues of the body, as it is densely innervated with sensory nerve fibres. A corneal abrasion is a painful injury to the epithelium caused by contact lenses, fingernails, paper cuts etc. Patients with chronic dry eye may experience corneal abrasions more often. The cornea is one of the fastest regenerative tissues in the body so the surface normally heals within a day or two, but abrasions are quite painful in the healing process. Even with a small abrasion; tearing, light sensitivity and a foreign body sensation may cause significant discomfort. Corneal abrasions may be treated with antibiotic eye drops as well as medicated drops to help with discomfort. Minor corneal abrasions typically heal within 3-4 days where more severe abrasions could take longer. Taking proper precautions during the healing process are crucial to a prompt recovery. Wearing contact lenses should be completely avoided until your physician advises it is safe to wear them again. It is also recommended to avoid risks by avoiding swimming and dry dusty environments that may further irritate the cornea or cause bacteria to form. Keeping your eyes safe from direct sunlight and avoid rubbing the eyes also aids in a speedy recovery time. Corneal erosion is a condition characterized by a recurrent failure of the corneas epithelial layer to properly attach to the deeper membrane layers. This leaves the sensitive nerves exposed causing severe pain and discomfort. 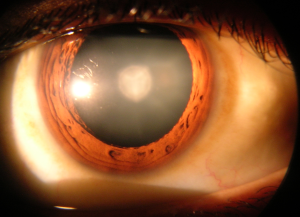 Corneal erosions are usually a result of previous corneal abrasions but can also stem from other corneal dystrophy. The symptoms of corneal erosion are much like that of an abrasion but on a more severe scale. Treatment of corneal erosions can vary from lubricating eye drops, therapeutic bandage contact lenses, and laser treatments. The type of treatment used depends on the location and size of the erosion.